A HIGHER TROD: Cushnie, Prendergast and McDonald. 50 Days. 3 Jamaicans. 1 Continent. A trio of adventurous Jamaican artists – filmmakers Donisha Prendergast and Mykal Cushnie and film producer/musician Kelissa McDonald – have set out for the Motherland, where they will spend the next two months exploring the continent and documenting their findings with the aptly titled docu-film 50 Days in Afrika. To learn more, visit 50daysinafrika.org. TALLAWAH: What do you want readers to know about 50 Days in Afrika? What are the primary objectives you hope to fulfil with this project? 50 Days in Afrika is a journey of self-discovery and business exploration. By immersing ourselves in the film industries of six Afrikan nations, we hope to uncover the importance of film in dispelling media images and replacing them with the historical context of Afrikan stories, how film can contribute to a nation’s economy, and identify lessons we can learn, as well as what we can offer in order to bridge the gap between Afrika and the Diaspora through the arts of storytelling and film. What first inspired this epic journey to the Motherland – and especially in the year of Jamaica 50? Even in this, Jamaica's 50th year of Independence, there is a significant disconnect between Jamaica and Afrika. Today, Nigeria has overtaken Hollywood and is now the world’s second largest film industry. There are a lot of lessons we can learn from their success that we can put to practice in our own country. Mykal and Doneisha, have you ever collaborated on previous projects? What was the chemistry like then, and are there any special expectations this time around? Yes. Most recently a music video for Magnum K&Q of Dancehall winner Deep JahI, and one for Tarrus Riley. We also have an ongoing project with the children in Tivoli Gardens community, the TG Peace Club, where we use film as a means to empower the children and supply them with the tools necessary to tell their own stories. As filmmakers, we understand each other, and our goals are very similar. You can see this in the projects we have done. 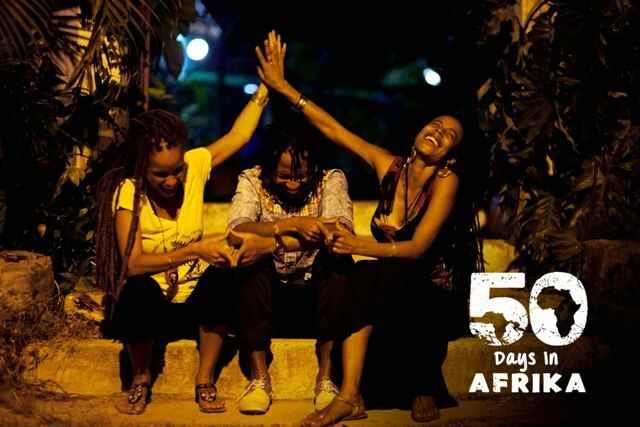 And what you can tell from that is that 50 Days in Afrika will not only be educative, but also inspiring and entertaining. What’s the (tentative) release date for the documentary?